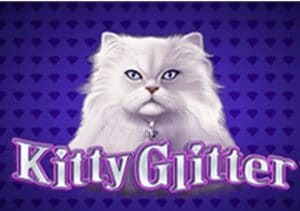 Kitty Glitter is a 5 reel 30 payline video slot powered by IGT/WagerWorks. Based on cats (obviously), this game comes with a 1,000 coin jackpot which is triggered by getting 5 White Persian cats. It can be played from 30p to £300 a spin and it has lots of wilds in the free spins feature which is the appeal. The Free Spins Bonus feature is triggered by getting 3 Kitty Bowl of Diamonds symbols (scatter). You will be rewarded with 15 free spins with an enhanced set of reels. The scatter also pays 3 times your stake during the free spins and appears on reels 2-4 only. You can get subsequent sets of 15 free spins for every 3 bonus trigger symbols up to a maximum of 225 free spins. Whilst this may sound like just another free spins feature, Kitty Glitter has something else to offer – it’s called the Diamond Accumulator feature. The Diamond symbol is the wild in the bonus feature and every time a diamond appears on the 5th reel, it is saved in the accumulator. If you collect 3 Diamonds in total, all White Persian cat symbols become wilds on reels 2 to 5. The 3rd Diamond is then collected and is present on all subsequent spins. If you are lucky enough to collect 12 Diamonds, you can expect some good wins as you should have a lots of extra wilds on the reels. This feature is unique (I think) and quite rewarding if you get a few diamonds. It reminds me a little of Cats (also by IGT) but I do prefer Kitty Glitter because I found the wins to be more rewarding. You can also try Water Dragons which is basically the same slot but with a different theme.